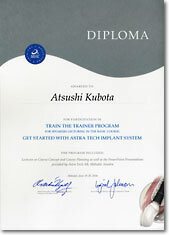 久保田　敦　Atsushi KUBOTA DDS., PhD., JBDA.. The Use of Recombinant Human Platelet-Derived Growth Factor for Maxillary Sinus Augmentation. 掲載媒体 ：　Int J Periodontics Restorative Dent. 2017 Mar/Apr;37(2):219-225. The Negative Effect of Combining rhBMP-2 and Bio-Oss on Bone Formation for Maxillary Sinus Augmentation. 掲載媒体 ：　Int J Periodontics Restorative Dent. 2012 Feb;32(1):61-7.